CALGARY, ALBERTA (August, 2017) – Coprolites are fossilized feces that give evidence of an organism's behavior and often contain food residues, parasite remains and other fossils that provide clues to ancient paleoecological relations. Many of the inclusions in coprolites are delicate and fossilized soft tissues, which in many cases are more likely preserved within the coprolites than in other rocks. However, the composition, size and organization of the inclusions within the coprolites make them difficult to analyze. Classic techniques, such as looking at thin sections under the microscope or Scanning Electron Microscopy (SEM) require destructive preparation and can destroy the specimens. 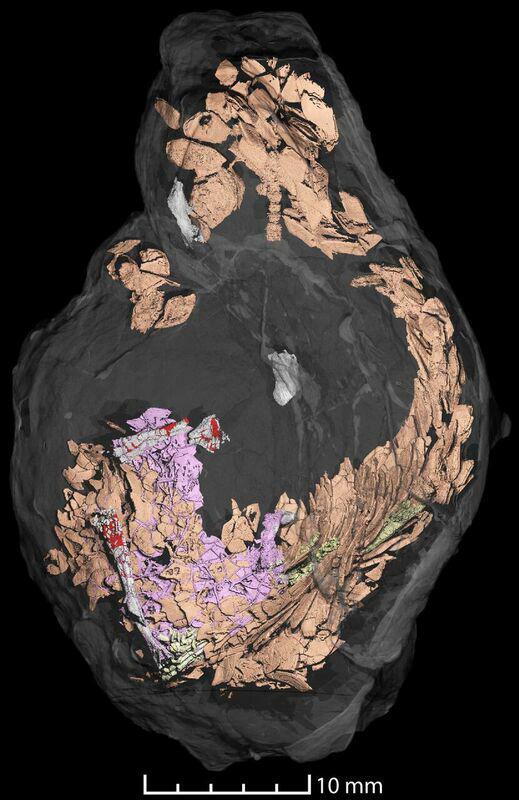 In a new study being presented at the annual Society of Vertebrate Paleontology meeting in Alberta, Canada researchers use synchrotron microtomography to understand as much of the content of the coprolites as possible. Contents from coprolites from the Upper Triassic bone beds Poland were segmented into 3D models. As researcher Martin Qvarnström explains, "Examples from two feces of Triassic age (230 million years old) include delicate remains of beetles in one, and a half-complete fish and fragments of crushed bivalves in the other." The coprolite with fish remains including fin rays, scales and bones that were fractured and sheared during ingestion/digestion was likely produced by a lungfish. The other coprolite contains various fully three-dimensional beetle remain and was produced by a medium-sized terrestrial animal that evidently targeted small beetles as prey. Likely candidates include animals like cynodonts and archosaurs. These examples underline the importance of coprolites, which have an underestimated potential in unraveling paleoecological relations from ancient ecosystems. Qvarnström explains, "I investigate the content of vertebrate coprolites with the aim to reconstruct trophic food webs of ancient ecosystems." Using these new advanced techniques give a rare glimpse into the paleodiets of organisms that lived over 200 million years ago. Image 1: Coprolite with fish remains. Image 2: Coprolite with beetle remains. Image 3: Fish scales (orange, with the ganoine layer highlighted in purple) and fin rays (green) in detail.